Bonding between atoms can take a variety of forms, but ionic bonding is conceptually one of the most straightforward. It involves the attraction between positively (cationic) and negatively (anionic) charged ions, such as occurs between sodium ions (Na+) and chloride ions (Cl–) in table salt (NaCl). These bonds are often quite strong (i.e., NaCl is solid), but can be easily disrupted (NaCl dissolves in water easily). In general, the parts of ionically-bonded molecules arrange themselves to maximize the extent of cation/anion interaction while minimizing the repulsive effects that can arise when large, bulky portions of the molecule get too near each other and attempt to invade each other’s space. Ionic bonding stands in contrast to covalent bonding, which relies on the sharing of electrons between atoms in directional clouds of electrons called orbitals. Which type of bonding occurs depends upon the willingness of atoms to relinquish and accept electrons. When this is ability is high, a relatively complete transfer of electrons occurs, and ionic bonding is the result. Organometallic molecules (which contain metals bonded to carbon) have a unique type of bonding that lies on a spectrum between ionic and covalent, depending on the metal atom and what ligands (the molecules bound to the metal) are present. A peculiar anomaly in the understanding of ionic bonding occurs in organometallic molecules known as decamethylmetallocenes. These compounds consist of a metal center flanked by two large pentamethylcyclopentadienyl anions, five-membered rings of carbon, each of which carries a methyl group (-CH3). Normally, the rings are parallel to each other, as this minimizes the possible clashing of methyl groups on different rings and keeps the negatively-charged rings as far away from each other as possible. 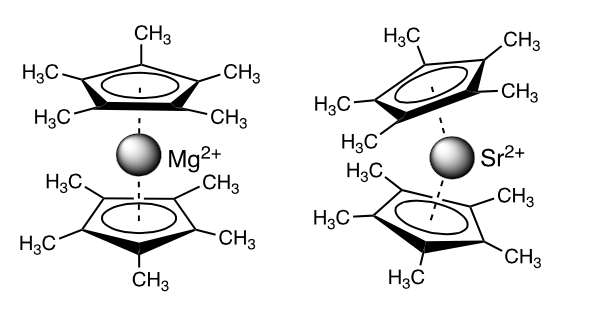 This is the case, for example, when the metal ion is magnesium. With the heavier metals calcium (Ca) and strontium (Sr), for instance, or when the metal is one of the rare earth (lanthanide) metals such as samarium (Sm), however, the rings are found to be non-parallel (the molecule is said to be “bent”). The methyl groups on the rings in a bent decamethylmetallocene are pushed toward each other, which should be a repulsive arrangement. What gives? The cases with the lanthanide metals are easier to analyze, as the bonding in compounds of these metals is less ionic because of the way their electrons are arranged. The lanthanides have high-energy electrons in orbitals that are confined owing to the high symmetry of a decamethylmetallocene with parallel rings (it has, for example, five-fold symmetry around an axis running through the center of each ring and the metal center). If the molecule bends, however, the symmetry is lowered, the region of space in which the electrons can move is increased (“orbital mixing” occurs), and the energy of these electrons is lowered. The total energy of the molecule is also lowered, making it more stable. This explanation is backed up with quantum mechanical calculations that employ density functional theory (DFT), which explicitly models electron interactions, and which confirm that energy lowering occurs with the bending of decamethylmetallocenes containing lanthanide ions as a result of their available d- and f-type orbitals. With calcium and strontium, however, this explanation doesn’t work. The bonding in these molecules is more ionic and salt-like than for the lanthanide compounds, and they don’t have the electrons and accessible orbitals of the lanthanides. If a metal ion such as Sr2+ is primarily a ball with a positive charge, why would a decamethylmetallocene with it at the center be bent? What does the molecule gain by bending? An explanation that had been offered for this relies on another, more subtle effect of bulky groups, the phenomenon of dispersion interactions. It is true that if bulky groups are pushed too tightly together, they exert a repulsive effect on each other, but at longer distances, dispersion interactions are actually attractive. Dispersion forces are weak, 20 times weaker than a typical carbon-carbon bond, for example, but decamethylmetallocenes are “floppy” molecules, and little energy is needed to bend them. DFT calculations often do a poor job in accounting for dispersion interactions, but they can be modified to take them into account, and when that is done, they can replicate the bending observed in Sr[C5(CH3)5]2. If the dispersion corrections are not used, the rings stay parallel. The case seems clear: lanthanide-containing molecules bend because of orbital interactions, but more ionic molecules such as Sr[C5(CH3)5]2 bend because of dispersion. Not so fast, claims a recent study of the situation. There are several items amiss with these conclusions. For one, ions such as Ca2+ and Sr2+ are more than pure balls of charge. They don’t have some of the types of electrons and accessible orbitals found in lanthanide species, but they have others that are often poorly modeled in conventional calculations. Secondly, although most DFT calculations don’t explicitly attempt to account for dispersion interactions, that doesn’t mean that they aren’t sometimes inadvertently captured. They may be overestimated in importance, or may accidentally appear as repulsive interactions, artifacts that can change depending on the distance between the dispersion-inducing groups. For the study, decamethylmetallocenes of strontium and samarium were compared because Sr2+ and Sm2+ ions have nearly identical sizes, so to a first approximation, the rings should be the same distance apart in their respective decamethylmetallocenes if the bonding were equally ionic in both. The new calculations on Sm2+ confirmed the old ones: Sm[C5(CH3)5]2 was found to be naturally bent, even when dispersion interactions were turned off — orbital interactions alone caused bending. With Sr[C5(CH3)5]2, however, dispersion interactions caused the molecule to bend, but so did orbital interactions, an effect that became more obvious the more complete the description of the Sr2+ ion was. The electronic effects alone were not able to cause enough bending to reproduce that found experimentally, but a combination of orbital and dispersion effects was — both were needed to get the “right” answer. Why is this important? Dispersion effects play significant roles in many areas of chemistry, from determining the boiling points of liquids to affecting protein folding. Being able to describe molecules accurately is one of the primary goals of computational chemistry, and modeling dispersion interactions is an integral part of this. The decamethylmetallocenes serve as clear test cases for determining how accurately we can quantify these weak, but critically important forces. These findings are described in the article entitled Dispersion and distortion in heavy group 2 and lanthanide decamethylmetallocenes: The (C5Me5)2(Sr,Sm) connection, recently published in the Journal of Organometallic Chemistry. This work was conducted by Ross F. Koby and Timothy P. Hanusa from Vanderbilt University. Timothy P. Hanusa is a professor of chemistry at Vanderbilt University. His research focus includes rational ligand design to control the reactivity of main-group and transition metal organometallic and coordination complexes, investigated steric effects on the reactivity and magnetic/electrochemical properties of metal complexes, and synthesized precursors to materials with desired electronic/optical properties. 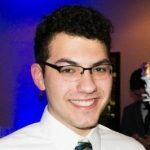 Ross Koby is a Ph.D. student at Vanderbilt University in the Department of Chemistry. His research focuses on the investigation of organometallics using mechanochemistry and green chemistry. He is interested in the intersection between organometallic synthesis and sustainability.